Peace: Is something the world achieves by understanding each other in mutual trust for equal opportunities. Uncertainties develop scepticism and fear, while knowledge makes sense, openness, acceptance and leads to dialogue. The more we know about each other, the smaller the world becomes. The Peace Globe Project began in the fall of 2006 with a simple post. The post ignited a flame in the blogosphere – The flame became a passion – The passion became a movement – and I want to be a Passionate Participant! Some say we should teach the worlds leaders and politicians how to blog. I don’t know if that’s a good idea – I mean at least some of them have made enough of a mess of things already. I would say we, the people, we bloggers should do it: Proving that blogging empowers us to make a better world. Each of ours posts is small steps, but when hundreds – thousands – say millions, moves in the same direction; who could stop us then? – For the very best course! Priceless. And it is my first June 4th post to read. We still have 6 hours in the United States ’til midnight. When I saw the sight of this very first post I got chills…..the global spirit and effort is amazing. Thanks Mimi and you know I feel its an honour to be a part of this great initiative! I took advantage of living in a country a bit head of you – all for a good course! Peace to you and yours too! I just simply had to come by and see your post. Oh we still have a while before we post but I have mine ready to go. Great post Renny!! You did a beautiful job. Well, we have to pull out again and I must get off of the pc. Thanks – Looking forward to your contribution too Jackie! Thanks Sandee – looking forward to read yours too! Truly great said! Glad to see you participating this year again too. Great to see you on board too! you make a wonderful ambassador for Peace Renny !!!! have a peaceful sleep…you deserve it !!!! Thanks Kim – and I do like to be an ambassador for a course like this you know !! I fully agree with you and say PEACE and LOVE !!! Thanks – great to see you participating too !!! Very well said, Renny!! Peace, love and blogs. Peace to Norway, and everywhere! Hi Eric!! Yea, great start and its moving on in a lovely way! Well said – always great to welcome new visitor! I love your sentiment of “make blogs, not wars” and agree completely that more understanding of each other throughout the world will make the world a better place. Peace to you and all you love. Glad you like my saying and the meaning behind it! Also good to see you – Thanks! thanks for drop at my peace post. Thanks – also for returning the favour! I’m very interested to see how many globes will be there by the end of the day. I hope Mimi’s site won’t crash… :o) Have a peaceful day and let love rule! Me too – its so exciting! Same to you and everyone else! Great saying; “make blogs and not wars “; that’s why we are all here. Each one of us, bringing something positive and sharing. Have a wonderful BlogBlast day ! Thanks for your share too and I wish you the same! This is such an interesting concept! What you are suggesting us is the highest form of diplomacy on earth: well done :D! I agree that blogging not brings people together but also brings down the boundaries the keep humans (and humanity) apart. And it also makes us see beyond appearances, religion, nationality, age, societal behaviour…. Make blogs, not war! May it catch on. Peace. Here’s to our larger voice being heard. What a great post and a great Peace Globe! Peace to you my friend. …. and your saying ROCKS, Renny – I love it! Love the sentiment! Peace to all. So nice to meet you and see your peace globe! I went to Norway on my honeymoon and loved your country. Thanks for visiting. Love the saying. That’s quotable. Peace to you too! Wish the “make blogs not war” was the way of the world. I agree that thousands of bloggers all heading in one peaceful direction is a powerful thing. Very nice to meet you! Peace to you on this hopeful day. Thanks for visiting my Peace Globe and Blog Blast at Sacred Ruminations and leaving the link back here.. I’ve enjoyed seeing what everyone shared today after posting different globes & blasts on each of my blogs this morning. Love the slogan on yours! Great to see everyone focused on peace for the day!!! Great post. I love “make blogs not war”. It is perfect. Thank you for stopping by my blog “BrainFreeze”. All we are saying is, give peace a chance. May you have a peaceful day today. Well said, Renny. As another blogger said in their post, “when leaders move from the love of power to the power of love” the world will be much better off. Peace! Thanks for visiting mine. Peace to you and all of Norway! Wonderful post, Renny. As Mimi knows so well, we can’t promote peace enough, and you’re an especially fine advocate. Excellent saying Renny! Peace to you and yours. thank you for giving me an opportunity to join you guys!! keep up the good spirit,Renny! Peace ,Love and Rock ‘n Roll!! “Make Blogs! Not War!” I love it!!! Peace to you and your family! Love your thought of small steps along the very best course, Renny. From Oregon, US to Norway. We speak with one common voice. Peace! 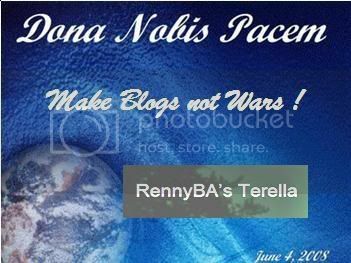 Make Blogs Not War …I really like that! Your post was inspiring, thank you for sharing. May Peace be with you and your family today and always. Thank You for visiting my blog today. It is my first time blogging for Peace. It feels good. Beautiful. Thank you for stopping by my blog. This is beautiful. Thank you for coming by. It was good to have greetings from Norway and know that the globes are spreading around the globe. Amen to understanding each other in mutual trust…to equal opportunities. My latest globe is the third one I’ve don so far, and is the best. Although trying to find the best free picture edit software that works easily is not easy. You get what you pay for, I guess. Thanks for visiting my blog and your comment. if i may, your written English is superb. many years ao when Europe, I was amazes at the number of people who spoke excellent English, although not their first language. Better than most Americans fluent in any western European language. Nice site. I’ll return. Peace! Thanks for the visit from Norway, My wish for you and yours is worldwide peace during you lifetime, I would like to see the same thing, they need to hurry up. I really like your very positive post! It is so easy to get mired down with gloom when thinking about peace, but yes, we CAN make a difference. It is us, not the politicians who must make the changes. Thanks for your message and peace to you from the United States! Wonderful thoughts! Blogging does make the world seem smaller, doesn’t it? It’s so wonderful to see that we can join together as one…from Norway to Texas! Peace to you. Thank you very much for stopping by to visit my blog. I like your blog for peace very much. What a wonderful concept – to get millions of people talking about peace. I’d love to turn on the news and see a report that the blogosphere had gone to peace for the day. It’s something to work toward. Since I’ve been blogging I’ve made friends with people from all over the world and discovered that we are so much more alike than we are different. Peace be with you my friend that I only met in cyber space.thank you for visiting me on my site so i tryurned the favor. i hope that you are haveing a great day.That’s my story and I’m sticking to it. A really good concept! I think you’re pretty good with people, a good diplomat but also a realist one. I vote Renny for the Presidency of Norway! Wait a sec… does Norway has a President in the first place? :lol: Oh, I’m bad! Hi Renny! Your Peace Globe is perfect! :) I love this project, don’t you? And I am sooooooo looking forward to meeting you in Sept/Oct! Thank you for visiting my blog. It is always nice to meet other Peace Bloggers. I hope we can stay in touch! I don’t think I have ever had a reader from Norway..love it! I agree, if everybody blogged al the time there’d be no time for bad stuff. Blogging is very time consuming. I agree that we need to try to understand people from all across this spinning globe we live on. Blogging is a perfect way to work on that. Thanks for visiting my blog, Renny. Hope you have a wonderful “Day After” Blogblast for Peace Day. Peace and hugs from Charleston, S.C. It is so true how blogging can help us all understand each other a lot more and break down the cultural barriers. Awesome Peace Post! What a great idea! I read blogs written by people from around the world, including Iraq and many other places where there is war and I’ve learned so much. When we understand each other, we humanize each other and then it’s harder to kill each other in a war. To Peace, Renny. To Peace! peace can only be obtained by mutual respect. I agree totally Renny. All our efforts combined is a formidable force for peace. Blogs we do…wars we shoo! Vrede! Thank you for your comment on my site. Peace to you and yours. Thanks for mentioning this resource. I had not heard of it, but many of my “blogging buddies” and I have been asking the heady question, can blogs unite the world? Having said that, I just found your blog through Blog Catalog today and I do think the sharing you do here … where I can visit you and your part of the world, that leads to understanding and understanding does lead to unity!